Comissioned to build, supply and operate weapons in this documentary. 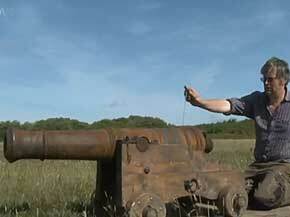 a British cannon at them from 50 feet. To view the video please click on the image below. 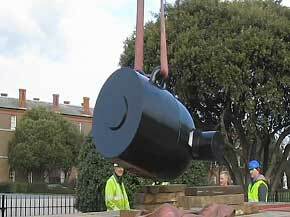 DANGLING in the cold sea breeze, a five-ton mortar gun was lifted into place at the Royal Marines Museum after a £7,000 restoration project. The cast iron mortar, which was used to fire 13-inch shells during target practice at Eastney barracks in the 19th century, is back on display at the entrance of the museum after a 12-month hiatus. 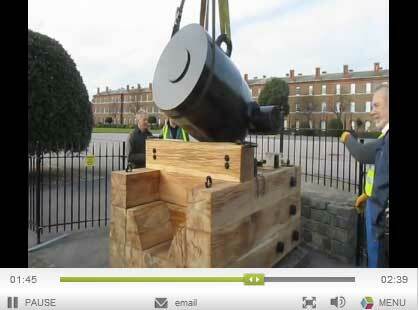 A crane truck yesterday delivered a new four-tonne English oak gun carriage which was made in Cornwall to replace the original base that had gone rotten. The new base was made by specialists Mainmast Conservation in Cornwall which has made similar gun carriages for HMS Victory in Portsmouth Historic Dockyard. The mortar now looks exactly as it did in 1855. Comission to build, deliver and install, two 24pdr and one 12pdr "Miuller" pattern gun carriages, to MHS Victory, the oldest comissioned war ship in the world. 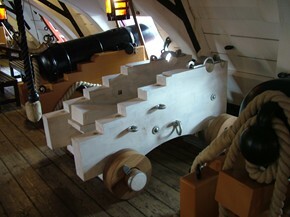 The design and construction of a pair of naval carriages to mount to cannon salvaged from the wrecks of the Spanish armada, for the National Museum of Northern Ireland. No. 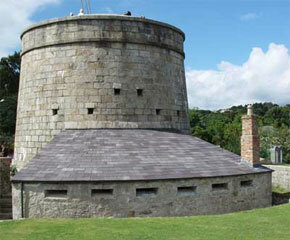 7 Martello Tower was part of the defences of Killiney Bay against a possible French invasion in the period 1804 to 1815. The other towers and batteries have suffered a variety of fates, but this one was rescued and restored to its original glory and function. As part of this restoration Mainmast Conservation work comissioned to design, build and install a replica dwarf pattern traversing seige carriage the first constructed for thirty years. We are currently in the process of cleaning, repairing and conserving the cartridge and shell hoists of the 6’’ coastal defence battery at the entrance to the river Tyne, along with the rotating Howarth ventilators fitted to the top of the building. 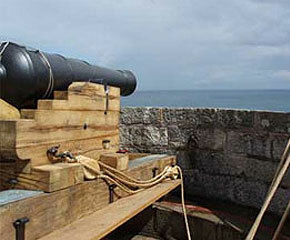 Design and make a new tompion for “Roaring Meg” the famous civil war siege mortar. Conservation and repair of 5 timber garrison carriages and manufacture of 1 replica timber garrison carriage. 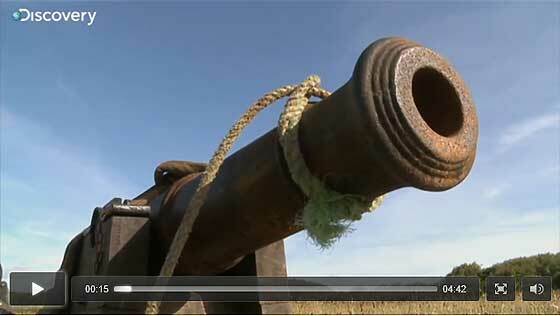 Ongoing conservation to a large collection of cannon and artillery. 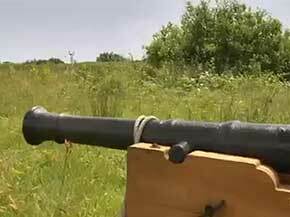 Design, build and test fire a full size working copy of “Roaring Meg” Colonel Birch’s famous civil war siege mortar. 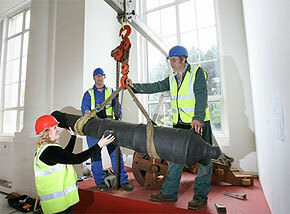 Restoration and conservation of private collection of early to mid 20c artillery pieces. Restore a 1950’s AEC Militant gun tractor. 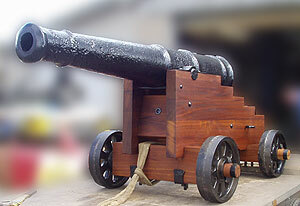 Design and build a working replica of a Victorian 6’’ rifled muzzle loading cannon. Assist with the restoration and re- arming of the heavy AA battery that defended RAF Predannack Down, during the second war, including compiling and presenting a wartime history of the Lizard and its people.